What Do Japanese People Say Before Eating? Many languages (if not all) have set phrases that are used before beginning a meal. In English, we say things such as “let’s eat” or “dig in” and such. So what do Japanese people say before eating? That’s the topic of today’s lesson and the first thing you’ll learn in the next part. In addition to the set phrase, you’ll also get a little bit of background on the word, and then some of the other phrases that will be useful either during the meal, or once you’ve finished. As far as I have seen, there’s not much of a difference between these two, except that the first one is more commonly used than the second. That last translation is actually pretty close to the literal meaning of いただきます in Japanese. But in order to understand it more fully, we have to take a short trip into the grammar behind the verb. Don’t worry, it’ll be quick! The first thing you’ll want to know is that the normal Japanese verb for “to receive” is もらう (morau). This is a verb that had many possible uses in different grammatical constructs, but that’s something we can save for another time. The second thing you’ll need to know is how もらう is related to いただく (the plan form of いただきます). In Japanese, as I’m sure you probably know, there are several levels of formality. One of those levels if often called the “humble form” which means that it is the one you use when speaking to (or about) people who are higher than you in social standing. いただく is this humble version of the verb もらう. This means that while both of these words mean “to receive” in Japanese, the いただく is the appropriate one to use in situations where you are expressing humility. So when would be a good time to be polite? When you’re about to receive a meal of course! You’ll no doubt have noticed that the phrase いただきます is the mass-form of いただく, which means that it’s even more polite than just the plain いただく. いただきます is a set phrase used before begining a meal. If you keep those in mind, then you should be good 99% of the time. In addition to meals, it’s not uncommon to use this phrase in other situations where it may have similar connotations. For example, in the (amazing) anime Kakegurui「賭ケグルイ」which you can watch on and learn Japanese from Netflix, after winning a huge round of gambling, one of the girls yells 「頂きま～す」 while scooping up her pile of winnings. いただきます | The normal version. いっただきまーす | Adding a っ in between the first two mora and then holding the ぁ vowel one beat longer. いただきま～す | Holding the ぁ vowel again, but this time fluctuating the tone up or down. 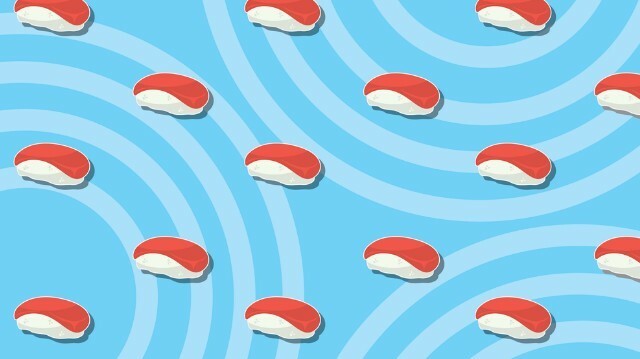 So now that you know what this word means, let’s take a look at a few other things that might be useful while you’re eating food in Japan, or in a Japanese restaurant. Just as there is a set phrase to use before you eat a meal, there is also one to use after you are finished eating. That Japanese phrase is ごちそうさまでした (gochisō samadeshita) and you say it primarily to thank and honor the people who have prepared the food for you. You’ve heard is said that the Japanese people are incredibly polite. The interesting thing is that this high praise would be said to someone who had prepared you even a simple meal of say, rice and fish. It’s also pretty common to just hear ごちそうさま used as a shorter version of this same phrase. Look out for the same types of phonetic changes that いただきます sometimes receives when a person is expressing positive emotion. They would then typically reply with お粗末様でした (o-somastsu samadeshita) which basically means “it was nothing special” and is said in response to ご馳走様でした. These are some of the essential Japanese phrases that you’ll want to become familiar with so that you can use them yourself when it’s appropriate. Using polite manners can go a long way in any language. Speaking of manners, let’s talk about a few Japanese table manners before ending this lesson. Here are a few pointers when it comes to eating with proper manners in Japanese. This won’t cover everything, but it’ll go over some of the big ones that you probably wouldn’t consider unless you’ve already spent some time living in Asia. So besides the phrases that we went over above, let’s first talk about chopsticks. There are a couple of things to keep in mind when eating with chopsticks. The first thing is that you never want to stab your chopsticks into your food. The reason is that it looks too similar to incense that is burned during funeral rites… Not exactly something you want to think about while eating! Another “no-no” is to pass food from one person’s chopsticks directly to another person’s chopsticks. Again, there is something similar to this done at funerals, so stay clear of that behavior. Instead, if you’re going to serve someone a piece of food, pick it up with your chopsticks and place it on their plate. Usually when you eat, there will be lots of food on many different plates. You should take what you want and put in onto your own plate before then proceeding to eat it. Go ahead and refill on food as needed, but just be sure not to eat directly from the communal plates of food. When it comes to drinks, you shouldn’t serve yourself but instead you should serve other people their refills, and then allow them to refill your cup. The basic rule is to keep people’s cups full. If you see one empty or really low, go ahead and refill it. So what if you’re done drinking, but people keep giving you refills? Just stop drinking and let the cup remain filled. There is probably some confusion on this part of Japanese culture, as a lot of foreigner thinks that Japanese people are a little rude or something when they make audible slurping noises while eating food such as udon or ramen, but in Japanese society, this is seen as a compliment to the chef for making delicious food. But there’s no need to intentionally go overboard and make really loud noises while you eat. Just let them fly naturally, baby! Like I said, just a quick briefing on table manners, but you could go more into depth if you wish. Do you know of any other table manner tips for people in Japan? Let me know by leaving a comment below! This peek into the Japanese style of eating and table manners brings back memories when I used to occasionally visit an old Japanese friend, Hoshiro, for dinner. Of course, we always had a good brand of hot saké to enhance the meal – and, on special occasions, Hoshiro would bring out his doburoku (濁酒), which was his cherished home-made saké. As the meal was served, I still remember him always saying to me, “Osaki ni dōzo! (お先にどうぞ! )” Which meant please go ahead and start eating – meaning I shouldn’t wait for others to be served. This was especially useful if the food should be eaten while it is at the optimum warm temperature. The first time he encouraged me to slurp my noodles, I thought he was kidding – because, in American culture, that is considered bad manners. But, Hoshiro explained that a moderate amount of noodle slurping was considered a compliment to the person preparing the food. One other thing I learned was that, if there were no dedicated chopsticks for the bowls of food to transfer food to my plate that I could use my own chopsticks. However, it is polite to use the opposite end of the chopsticks to transfer food to my plate – instead of using the part of the chopsticks that went into my mouth. Just a few things I learned along the way. Hey Jim, that is super cool! Getting to try out some home-made saké sounds like a real treat, and I’ll have to see if I can’t try some out for myself some time! I think one of the coolest things about the Japanese is just how different their culture and customs differ from ours in America. It’s really cool and exciting to learn how other people in the world see things and live their lives. Thanks got the great comment! Ive always been fascinated by Japanese culture and the way they do things. I have actually picked up quite a few words just from watching anime all the time lol. I hope to visit there in the future sometime as well. What would you say is the main religion in Japan? I know where I live it’s Christianity — so before we eat we don’t really say “let’s dig in” but we pray and give thanks for the food we are about to eat. Yeah, I know what you mean. I grew up in the Midwest, so Christianity is by far the dominant religion here and it is normal to pray and give thanks before eating. In Japan, there are really two primary religions: Shintō (神道 ) and Buddhism (仏教). Buddhism was introduced from China/India and has it’s roots back there, but Shintō is really the main “original” religion of Japan (if you will). The basic belief is that there is a spirit in everything, be it the mountain, sun, stream, etc. What’s interesting is that a survey I read the other day talked about the percentage of people in each region of the world who believed that religion was “very important” in their day to day lives, and Asia was near the bottom at 10% of people. That’s one aspect of culture that’s pretty different from America or Europe.